If you have been following my posts on portfolio changes you know that I have been running a fairly high cash position lately. I have been struggling to find new good investments. With a few days off during Chinese New Year I have tried to search for new investment cases. I wanted to find something in Europe or the US but again it is a China exposure. I guess I keep coming back to this market because it’s here I still can find companies at reasonable valuations. American stocks for example just feel so expensive. Entering at a 5% weight in my portfolio – XTEP International Holdings a sportswear and mainly sports shoe maker listed in Hong Kong with almost all of it sales in mainland China. The company you can say is a copy-cat on the way Nike sell their products. A strong offering of running shoes and other type of sport shoes and then offering a whole set of other sporting apparel in the same shop. The company was listed in 2008 and share-price wise not much has happened since, although the company has delivered solid dividend over the years and increased revenue significantly in the early years. 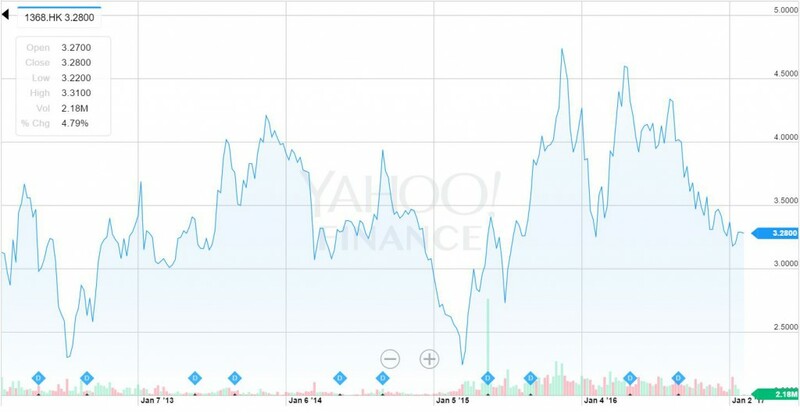 The company had a rough patch in 2013 and has now recovered closer to peak revenue levels. + Dividend payout ratio around 50% – 5% Div Yield. 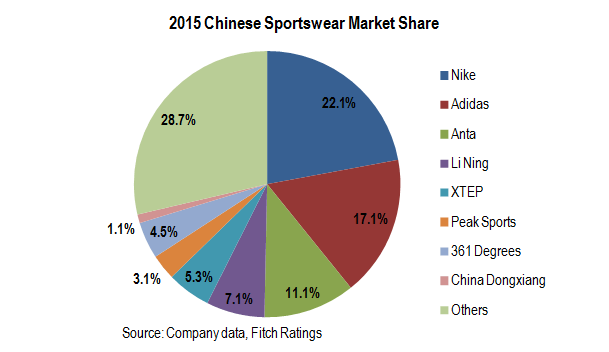 + Sportswear and the “healthy trend” has also reached China, projected to have continued good growth for many years. + Working with popular celebrity Nicholas Tse who promotes their brand (my girlfriend who is Chinese thought this was an important point). + Looks wise, shoes improved significantly over the last few years. Now selling a shoe that looks as good as Nike but sells and half the price. + Seem to be ahead of competition in terms of e-commerce sales through Tmall and other online channels (including their own homepage). + Competitors share price has been rallying lately, XTEP is the lagger, a positive in my view since I see it as unjustified. But perhaps also a worry, what does the market know that I don’t know? – History of trading at low multiples and high dividend yield in the past. Value trap? At least receiving a nice dividend is good, but why is the market so hesitant to multiple expansion? – Just a few years ago fierce competition among local players, leading to weakest hands being shaken out. XTEP being a semi-small player also struggled, somewhat worrisome. The largest rival Anta held up much better during those years. – Hard to judge what brands the Chinese would prefer among the local brands, some sell side analyst argue Li Ning has a better product offering and better brand image. – Lately sales have been dropping in apparel (more on that later). The market is lead by the international brands Nike and Adidas, likely one would expect more competition in the future from international players like New Balance, Asics etc. On the other hand there is probably room for consolidation of the “Others” piece of the pie, where probably Anta, Li Ning, XTEP, Peak Sports and 361 Degrees will be able to grow their market share. So basically the local competition to XTEP is four other Chinese players, where Anta, Li Ning and 361 Degrees are all listed. Peak Sports was also listed but was recently acquired. XTEP has been a clearly been lagging stock price wise and that’s the main reason why the stock look so cheap on metrics compared to the competition. We can see the tough competition mentioned earlier, in 2013, where all players were witnessing pressure on sales. What has happened since is that apparel has not recovered, rather hovering sideways, whereas footwear sales has shown very nice sales growth. 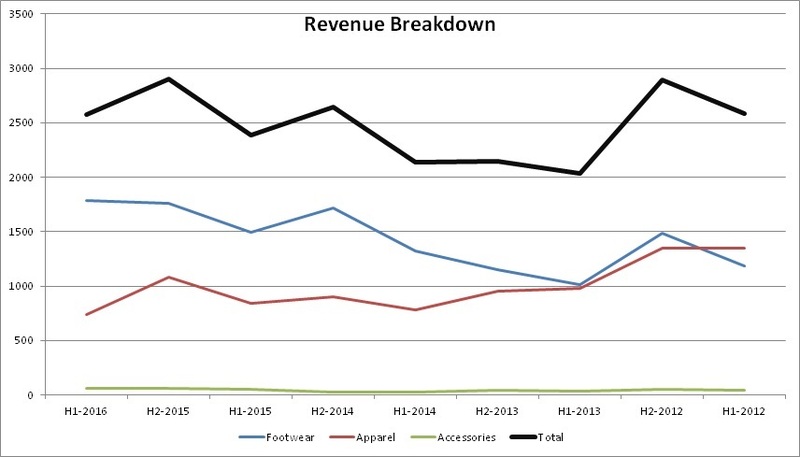 The last reported figures are a bit of a mystery and explains the share price weakness, apparel sales drops a lot, whereas if looking closely at the footwear data, H1 is normally weaker than H2, but the footwear sales comes in very strong. So what is happening with apparel? Well I don’t have a full answer, going in on their homepage I can see they are having heavy discounts on the clothes (80-85% discount on some items). The company has also stated a strategy on harder focus on footwear, becoming a leader in this field, expanding sales of soccer shoes etc. Otherwise we can see that the business is operating profitably and generating cash (which is 50% paid out in dividend). I’m willing to take a bet here that apparel will recover to its previous trend of revenues around 900m and the H2 figures for footwear should come in strong. Even if it sales comes in at current levels, the stock is trading cheap and there is much more room for upside surprise compared to downside, which the market seems to already have priced in. I don’t really see why XTEP should be trading at such a steep discount to its competition, being a small cap stock I’m betting that the market has miss-priced the stock rather than that they know something I have overlooked. If anyone has further input (on the ground testing of products etc) please do comment. I plan to visit Shanghai this month and will follow this up with a small field trip of checking out sportswear stores. Amer acquired PEAK PERFORMANCE not Peak Sports. Peak is still a Chinese owned company. Am I missing something? Are you commenting in the right place? I own shares in Anta, although I have been paring down the stake due to the increase in valuation. In the business of selling sportswear and shoes, I think that it is largely about managing the brand and making people feel that it is desirable to wear the brand. If you read Shoe Dog by Phil Knight, there is a little bit of insight of how the industry works and how Nike became the leader it is today. Given the importance of the brand, in China I think that the general perception is that Nike & Adidas are still viewed as top tier brands, while the other local brands are tier 2 and 3. 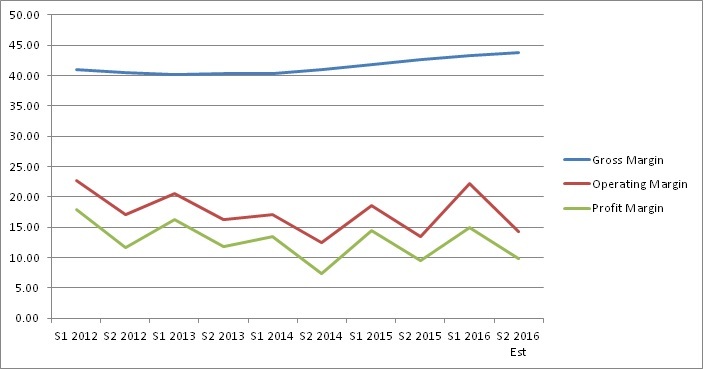 I like Anta because their results over the years imply better management relative to competitors. And there is a advantage of being bigger in that marketing costs are spread over a greater number of units. Anta is also gaining some traction overseas, particularly in the NBA. Basketball is a very widely followed sport in China so having their brand in the NBA would move them towards being a tier 1 brand in terms of desirability in consumer’s minds. Despite the low valuation, the thing that worries me about Xtep is the huge cash balance. Most of the cash raised in the IPO is unutilised. Also, they have been raising increasing their debt since 2011 despite being flush with cash. At best, this is poor capital management. At worst, the company could be inflating profits or misappropriating the cash. There is a Chinese sportswear company China Hongxing listed in Singapore. It has been suspended for a number of years now due to accounting irregularities. You can still see their brand in certain international tennis events though, which suggests that the business is not completely fake. But investors in the company have definitely lost a lot of money. Sorry being so slow to reply, I focused to get the YY posts out. Thank you for another great comment. I have to admit that I overlooked that the cash balance has been this high for 4-5 years already. It is very strange indeed. I have once before been fooled in a Chinese company that inflated sales, that was called Prince Frog, nowadays China Child Care. A very interesting and somewhat painful experience, it would be embarrassing to hit another landmine like that. So.. ..OK the company could be fraudulent, but let’s say it’s not, as you say it is still poor capital management. But they are not the only ones that hoard cash, even a company as Apple does that. They still have a 50%+ payout ratio which also is somewhat comforting. I have a few tell signs this is not fraudulent. Looking at taobao etc the homepage lists Xtep as selling fairly good amounts of shoes. Another somewhat comforting fact that is not the case is that one of the largest shareholders is Value Partners, which I do believe do their DD properly before taking a position. Still this definitely made me more cautious to my holding and will need to watch it closely. I will ponder a bit more on this, but I don’t think it makes to sell. I will have a look on this one. Looking forward to hearing from your Rolls-Royce analysis (watch list). Thanks Dave, but it will probably be a while before I release anything on Rolls-Royce. Also I’m not sure if it going to be any big news, its a well covered company and some hedge funds like Bronte has also been active in the discussion previously, that’s what caught my eye to begin with. Looking forward for some input!